DSI Premium Line Narrow Platform 3.0 is ideal for areas with limited space, such as missing lateral incisors. It provides the high implant strength that is usually difficult to achieve with small diameter implants. The strong and solid connection enables this implant to be used in the lower and upper jaw. The DSI NP 3.0mm has proven to have a very high fatigue strength and best comparative results, what makes it the most successful and leading narrow platform implant. 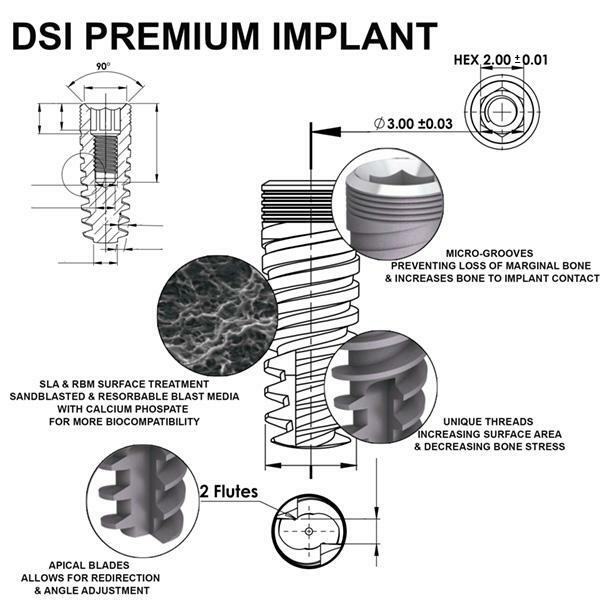 DSI Narrow diameter implants boast remarkable inherent promise. They make it possible to treat almost all cases involving narrow interdental spaces, especially in situations where there is a minimum amount of hard tissue. Please choose the length during the checkout! If you not select any length, the most popular one will be shipped.